The CZ 75 SP-01 SHADOW 2012 pistol differs in new procedures and operations added as a part of the serial production process (e.g. the manual fitting of the barrel, the lateral definition of the free movement of the bolt and the sophisticated trigger mechanism). The gun has a burnished barrel and its "orange 2012" name is based principally on its long thin and aluminium grips of that colour. 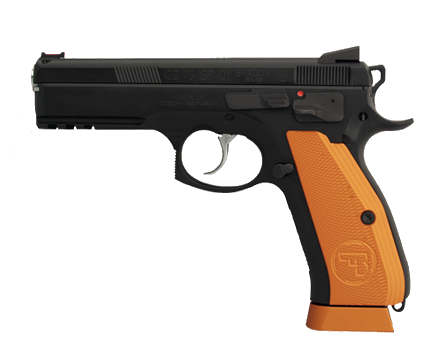 The weapon is presented in an identical case to that of the CZ 75 TS CZECHMATE. - better shooting comfort, increased accuracy. - more stable recoil during shooting. Parts service life increased. - smooth and precise trigger mechanism. De grips zijn in meerdere kleuren leverbaar.